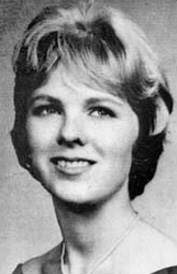 On July 18, 1969, Mary Jo Kopechne attended a party on Chappaquiddick Island, off the coast of Martha's Vineyard, Massachusetts. The celebration was in honor of the dedicated work of the Boiler Room Girls, and was the fourth such reunion of the Robert F. Kennedy campaign workers. Kopechne reportedly left the party at 11:15 p.m. with Robert's brother Ted, after he — according to his own account — offered to drive her to catch the last ferry back to Edgartown, where she was staying. She did not tell her close friends at the party that she was leaving, and she left her purse and keys behind. Kennedy drove the 1967 Oldsmobile Delmont 88 off a narrow, unlit bridge, which was without guardrails and was not on the route to Edgartown. The Oldsmobile landed in Poucha Pond and overturned in the water; Kennedy extricated himself from the vehicle and survived, but Kopechne did not. Kennedy failed to report the incident to the authorities until the car and Kopechne's body were discovered the next morning. Kopechne's parents said that they learned of their daughter's death from Kennedy himself, before he informed authorities of his involvement. However, they learned Kennedy had been the driver from wire press releases some time later. A private funeral for Kopechne was held on July 22, 1969, at St. Vincent's Roman Catholic Church in Plymouth, Pennsylvania, attended by Kennedy. She is buried in the parish cemetery on the side of Larksville Mountain. A week after the incident, Kennedy pleaded guilty to leaving the scene of an accident after causing injury. He received a two-month suspended sentence. On a national television broadcast that night, Kennedy said that he had not been driving "under the influence of liquor" nor had he ever had a "private relationship" with Kopechne. The Chappaquiddick incident and Kopechne's death became the topic of at least fifteen books, as well as a fictionalized treatment by Joyce Carol Oates. Questions remained about Kennedy's timeline of events that night, specifically his actions following the incident. The quality of the investigation has been scrutinized, particularly whether official deference was given to a powerful and influential politician, and his family. The events surrounding Kopechne's death damaged Kennedy's reputation and are regarded as a major reason that he was never able to mount a successful campaign for President of the United States. Kennedy expressed remorse over his role in her death, in his posthumously-published memoir, True Compass.